We spent the week in sunny Texas, but got home yesterday to dreary drizzle. Blech. Luckily, we had fun brunch plans and all the ingredients for a steamy soup ready for today. There’s really nothing better, in my opinion, than a warm bowl between your hands on a dark winter night. Even better if the contents of that bowl are sprinkled with bacon. 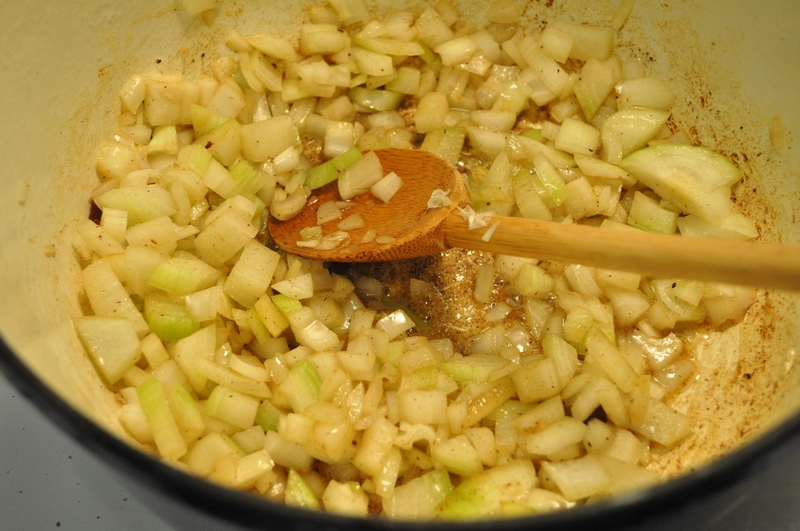 This recipe comes from a great book called Art of the Slow Cooker , which we use pretty often. I substituted a few ingredients to stay within the Dark Days SOLE requirements and made a few other modifications to make my life easier. It is deliciously creamy and satisfying, but pretty healthy and quick to make. My slow cooker was indispensible for this soup. I used it to make the vegetable stock a few weeks ago, which I froze, to cook the pumpkin overnight last night, and to make the soup this afternoon. If you don’t have a slow cooker, you could make the stock and soup in a heavy pot on the stove and follow the oven roasting method for cooking the pumpkin. Melt the butter in a heavy-bottomed pot or Dutch oven . Add the onion and saute over medium heat until the onion is soft and translucent, about 3 minutes. 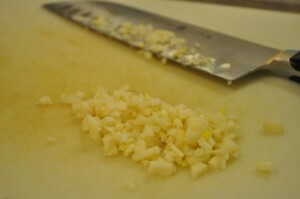 Add the garlic and cook briefly. Note: The onion is dark in the photo above because we crisped the bacon first and then used the same pot for the onion to add a little exta bacon-y flavor. This is a good method if you want to garnish with bacon, but it’s not necessary. Stir in the pumpkin, broth, nutmeg, salt, and pepper and bring to a boil. 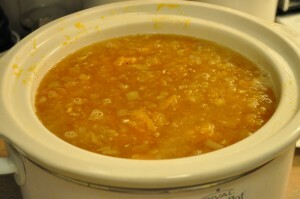 Transfer to a 5- to 6-quart slow cooker and cook on low for about 8 hours (or high for about 4). Be careful when pouring the soup into the crock. It splashes! Just before eating, add the half and half and cheese and use an immersion blender to puree the soup. If you don’t have an immersion blender, you can use a blender, but be very careful. Blending hot liquid can lead to an explosion, so please let it cool down for some time before you blend. 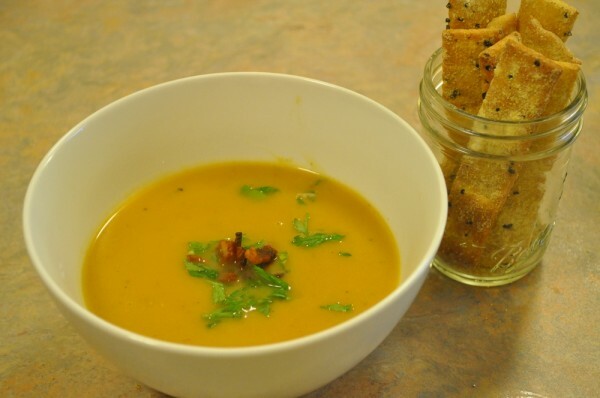 Ladle the soup into bowls and garnish with the parsley and bacon or toasted nuts, if desired. Any leftovers can be frozen. We served this with homemade crackers.